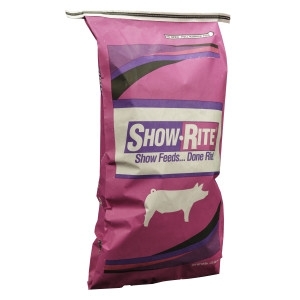 Show-Rite® Grower 40-90 is a pelleted feed designed to optimize frame, skeletal development, and muscularity for pigs weighing 40-90 pounds. The perfect transition feed from a starter or as you first purchase your show pigs and get them home. *One unit of phytase activity (FYT) is defined as the quantity of enzyme that liberates 1 micromol of inorganic phosphorus per minute. Environmental factors such as feed pH and moisture and processing methods like pelleting or extrusion may affect enzyme activity.